Build your own "V" shaped 36" trough style deer feeder. You will need lumber,preferable cedar or redwood, one- 1x8x9 piece and a 2x4 with a minimum length of three feet. The pieces of lumber will need to be ripped to narrower widths. You will also need 14-#8x1 ½" wood screws and four ¼" x 20 x 3" carriage bolts, matching wing nuts and washers. These will be used to attach the legs to the trough. Cut your 1x8 into 2-36" lengths. Leave one piece its full 7¼" width and rip the other to 6 ½". Take the remaining two feet of the 1x8 and rip it to 3 ¾" in width. This piece of lumber must be cut into two triangles with a miter saw. Since these four pieces of lumber get attached to one another at their edges, screw holes must be drilled first or the lumber will soon split. On the 1x7 1/4"x 36, drill two holes at each end 3/8" from the end and 1 1/2" from the sides. Along one long edge, drill six equally spaced holes 3/8" from the edge. On the 1x6 ½"x 36, drill two holes in each end 3/8" from the end and 1 ½" from the sides. Take the two triangles and drill two 5/8" diameter holes perpendicular to the short point that are located 1" and 2 ¼" from the long flat edge. Lay the 1x6 ½" board on a flat work bench so that one edge is close to the bench's end. Stand the 1 x 7 ¼" on its edge next to the 1x6 ¼ so the screw holes are closest to the bench and aligned with the 1x6 1/4. Secure the larger piece of lumber to the smaller one using the wood screws making sure the ends of each board align with one another. Once all the screws are in place, turn the trough over and set it on one the triangles so that the triangle sets flush with the trough's end. It's a good practice to predrill the screw holes for the triangle using the holes you previously drilled in the long length lumber. This will keep your triangles from splitting or breaking prematurely. Attach each triangle to the trough. Drill out four 5/8" drain holes in the trough's vee bottom. Your trough is now complete and can be sanded or left rough. Now assemnle the legs. Get your 2x4 and cut it to 36" in length and rip it into two equal halves. Using the triangles as your guide, drill two 5/8" holes in one end of the leg on its center line. Each hole will be 1" and 2 ¼" from the top of the leg respectively. Once you have done this, you can apply an exterior grade finish or leave the lumber raw. To set the feeder outside, you will need to attach the legs to the trough using the carriage bolts, washers and wing nuts. Once it is assembled, it is time to set it up. Good luck ! Find a hollow stump put a piece of plywood on the bottom. cut about a 2 1/2'' hole in the stump at the bottom, then cut a piece of plywood about the same size and shape of the top of he stump. put a lag bolt in the stump through the plywood so you can slide the top open. fill it with corn and there you have it. the squirrels will dig the corn out to eat the germ leaving the rest of the kernel. this makes your corn last longer and the stump looks more natural. Return to the main deer feeder page, or check our other types of homemade deer feeder plans. This is part of an article written by John Grant that talks about building a trough style deer feeder. Before anything else, it is necessary to procure all the right tools and materials first before moving on with the building process. The required tools in making deer feeders include a pencil and a paper, a tape measure, a posthole digger, a hammer, and a saw. In the meantime, nails, wood, and feed are all the materials needed to build stable and reliable deer feeders. When building deer feeders, the process can be classified into five separate parts, namely the location, the trough, the roof, the fences, and the foundation. Let's take a closer look at how to do these things the right way. 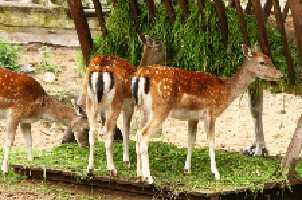 When selecting a location where to build a deer feeder, people must first consider the number of deer they are planning to feed. For larger numbers, a complex deer feeder may easily get the right job done. However, a simple backyard feeder is enough when planning to feed just a few numbers of deer. In all kinds of deer feeders, the trough plays a very important role especially because it is where the feed is to be placed. In order for a trough to be effective, it must be spacious enough to accommodate a deer and at the same time simple looking in order to avoid attracting unwanted animals from gorging the feed. At the same time, it is important to arrange the walls of the trough in a slightly slanted position to allow the deer better access to the feed. The roof is another important aspect of deer feeders because it keeps the food dry. In making the roof, simply attach four poles on the outside corners of the trough. Another important thing to remember is to choose poles that are high enough for the deer to fit inside. In making deer feeders, fences can contribute to the overall effectiveness of these stations. Because deer are very much wary of all the predators near them, it is best to install some fences around these structures. By doing this, the deer will feel much safer and they will stay longer within the fence. When making fences, it is important to remember that the feeder must be stationed directly inside the fence, and can hold in between 20 to 50 deer all at the same time. To make the deer feeders stronger and more stable, build a solid foundation for the structures by cementing their poles directly onto the ground. This is necessary to keep the feeding stations from collapsing.